A National Oceanic and Atmospheric Administration Research Vessel has just located the wreck of the missing F/V DESTINATION that sank in the Bering Sea this past February. The vessel and its six crew members were tragically lost in the capsize. On the cold morning of Saturday, February 11, 2017, crew aboard the F/V DESTINATION was traveling to the fishing grounds and was just off St. George Island in the Pribilofs of the Bering Sea. Events that followed before the vessel ultimately sank are being investigated by the U.S. Coast Guard. The crew did not have time to send a May Day—only an Emergency Position-Indicating Radio Beacon signal was set off by F/V DESTINATION crew. This allowed immediate responders to reach the destination, but only buoys, a life ring and other debris were found at the site. The U.S. Coast Guard spent the following months searching tirelessly for the vessel, covering nearly 6,000 square miles of sea before suspending efforts. NOAA research vessels Oscar Dyson and Fairweather began their search in April of 2017 using multibeam echo sounder and hydrographic survey technology. Finally, an exploration by the vessel Fairweather detected the wreck on an early July search. 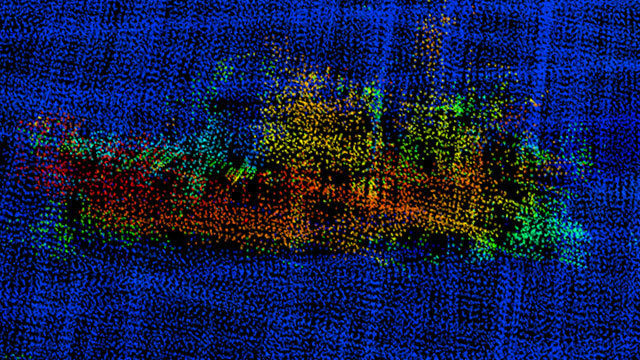 In a 3-D image released by NOAA, the F/V DESTINATION is clearly visible along with its crabbing equipment, deck crane aft, and skeg rudder. The wreckage was found in 250 feet of water in the Bering Sea. “The confirmation is based on the characteristics of the vessel—the length, the beam, the shape of the pilothouse and the fact that there were crab pots on board,” said NOAA spokesman Jonathan Shannon. A U.S. Coast Guard dive team aboard the Cutter Healy is expected to investigate the wreckage close up later this month using a remotely operated vehicle equipped with a camera. The Coast Guard’s Marine Board of Investigation will hold a public hearing in August. The loved ones of the six men on board identify them as Charles Glenn Jones, Larry O’Grady, Raymond Vincler, Darrik Seibold, Kai Hamik and Jeff Hathaway. The community has organized memorial plots, events, and fundraisers to honor the men and their legacies. Our thoughts and prayers are with the families. This is the worst tragedy to occur in the Alaska fishing industry in the last decade.